Often described as the American The Homecoming, Buried Child is the 1979 Pulitzer Prize-winning drama by Sam Shepard that catapulted him into the stratosphere of master playwrights. It’s a strange mix of realism, a thriller and a very dark comedy, and Scott Elliot’s uneven revival never lets you figure out which, but still manages to keep a greasy grip throughout. It starts slowly, with a very normal husband and wife conversation, and for the entire first act it continues to be very normal. There’s no letting on that something darker lurks beneath the surface, which is both the play’s intrigue and downfall. Why Dodge (Ed Harris) is so cranky that his wife, Halie (Amy Madigan) is popping out to see the pastor, and why they have such a protective eye over their clearly grown-up son Tilden (Barnaby Kay) is baffling, and when the curtain closes at the end of the first act, it’s perplexing that nothing has really happened. But this doesn’t last for long. What seems to be an everyday family on the surface is quickly revealed to be otherwise, as the action spirals into destruction on the arrival of grandson Vince (Jeremy Irvine) and girlfriend Shelly (Charlotte Hope). When Vince is apparently unrecognisable to his entire family, a catalyst goes off like a grenade, and that’s when Shepard’s play comes into its own, becoming a swirling, toxic tangle of truths. It’s been a while since a play on the West End has been so well cast. Ed Harris as the grouchy, unable Dodge gives a masterclass in acting, and Amy Madigan is perfectly snarky as the mother with the big secret. Barnaby Kay’s Tilden is both endearingly sweet, with a dose of menace lurking underneath. Newcomer Charlotte Hope is utterly captivating as Shelly, the startlingly unafraid girlfriend who becomes determined to dig up this buried family secret. There are a dozen different themes bubbling away in this American Gothic, draped within a creaky, crumbling set, courtesy of Derek McLane. 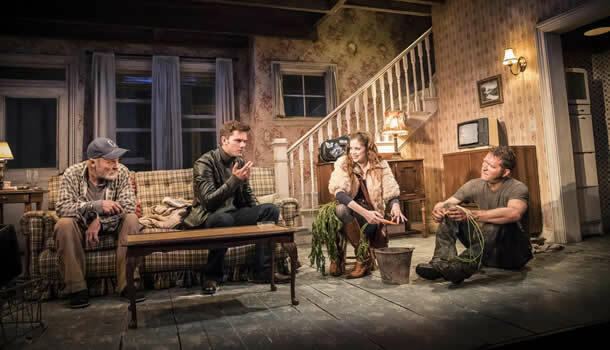 Buried Child twists and turns; it’s about masculinity and shattered dreams, fragility and mental health, with a strong undercurrent of horror at the core, wound into the madness of the action. It’s uncomfortably funny, it’s uncomfortably terrifying, but it is comfortably brilliant.